Negotiating our way down the steep driveway we were greeted by a cheery, shaved-headed, healthy and incredibly fit looking man whose age was indeterminable. 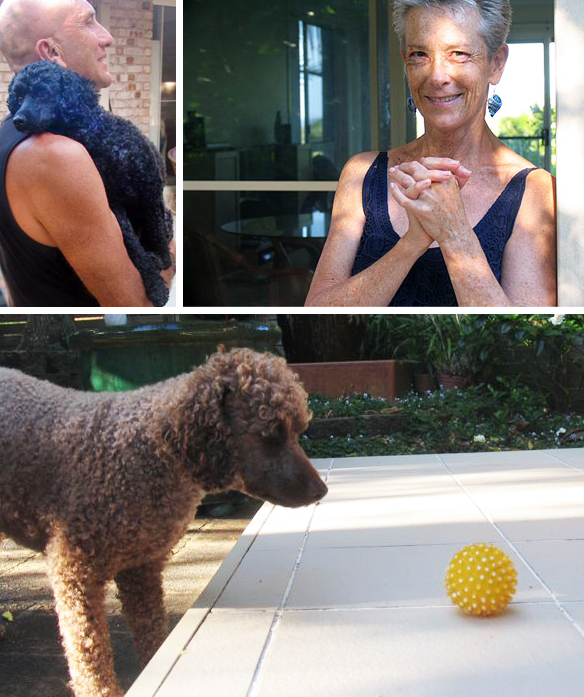 With a warm hearty handshake we were welcomed inside to meet wife Glenice, and poodles, Louie and Lucy. After taking in the sweeping views over Tallows Beach, Alan handed Prue a ‘brief bio’… eh hem… since when is five pages considered brief? Scanning the ‘brief bio’, a particular word repeatedly appeared – surfing-director, surfing-administrator, surfing-world championships, and did we mention surfing? OMG. 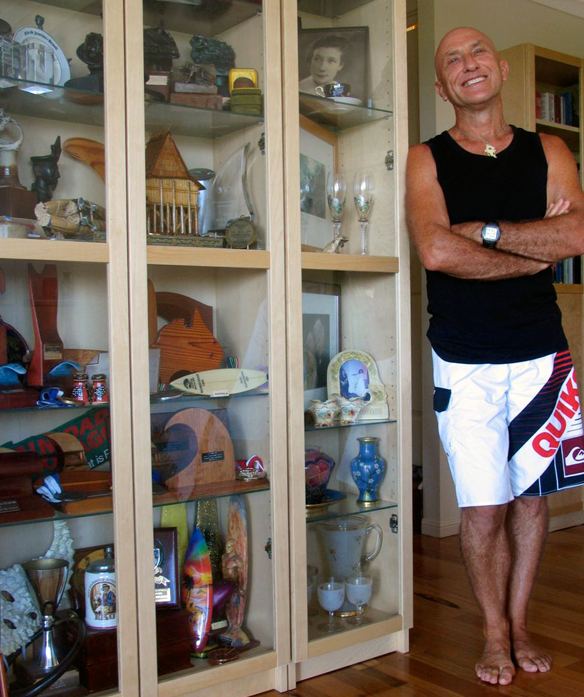 This man has done everything in the world of surfing except be a professional surfer. Surfing was not a profession back in the early days but that didn’t stop Alan from immersing himself in his passion. Having grown up in Preston (Melbourne), which is nowhere near any beach, his parents bought a holiday house in coastal Lorne (2hrs south west of Melbourne on the Great Ocean Road) where from age 8 he spent most of his weekends and school holidays … clearly, surfing. 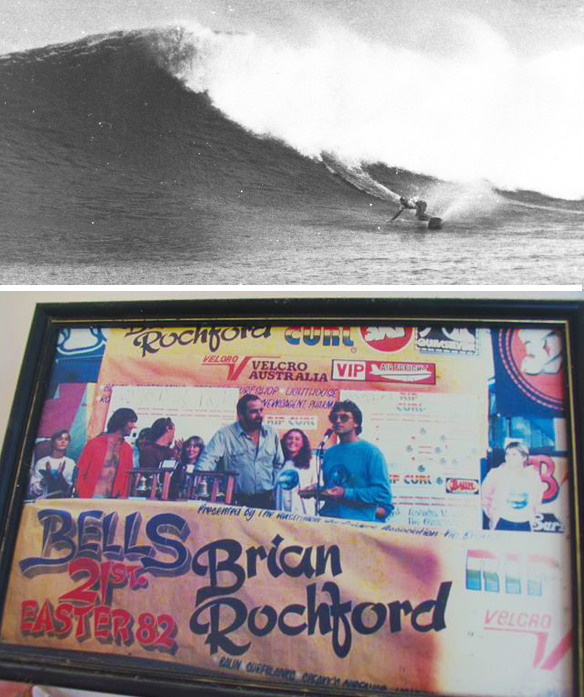 Growing up with the likes of Wayne Lynch and Gail Couper, pro surfing hadn’t really started and Alan continued with his studies graduating with a Diploma of Business Studies at Preston Institute. After 4 years as an auditor with TAA and heading down the coast to surf at the weekends, he and Glenice married and moved to Anglesea, near Geelong. What work did you do after moving to Anglesea? Well before we left Melbourne I had completed a diploma of teaching, so I taught for a bit at Corio Tech in Geelong. After about 4 years I resigned and started bricklaying with a mate of mine in Anglesea. Did you have enough energy to surf after bricklaying all day? It actually turned out to be quite good for me. I’d had a few surfing injuries but the movement required for bricklaying seemed to help. But that wound up after about 18 months because my mate left to go travelling. So, what did you do then? Well, I’d always been involved with surfing as a competitor (from about the age of 15) which resulted in being on committees and involved in clubs and things… usually in administration… so another mate asked whether I’d be interested in opening up an office for the Surfing Association in Torquay… because there was no organisation for surfing at that time. 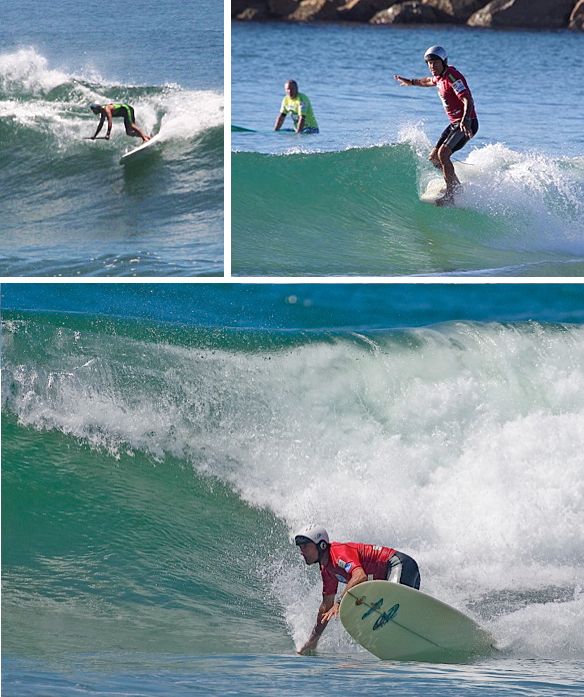 So I did that and we ran the Bells Easter Surf Tournament, among many other things. That tournament has been going for as long as I remember. Did you start it? No, I didn’t start it but we ran it and I was the tournament director for about 4 years. My job then was to somehow turn the association into a business so that they could afford to keep me on. One of the things I did was develop a program for coaching accreditation. 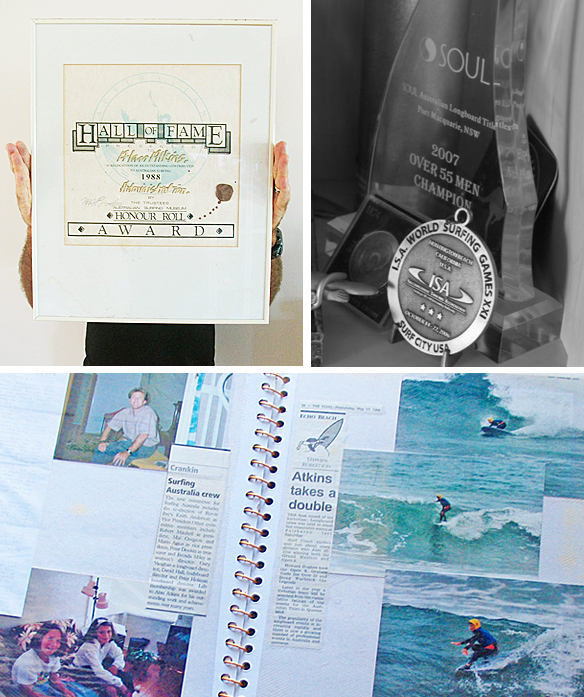 I began writing and formulating a coaching manual and then we introduced surf awareness in schools and slowly bits and pieces of revenue came in… I also wrote articles and did surf reports… and the association was able to keep running. I use to do the surf report for EON FM one of the first FM radio stations in Melbourne. I did that everyday for about 10 years. Have you ever seen such a chokkas trophy cabinet! Notice Alan has been kind enough to offer a third of the cabinet to family memorabilia. Your generosity is too much Alan! Yeah I use to get up just on daybreak every morning to check the weather and the swell and ring in to the station the reports of all the local breaks… once you knew one, you could work out the rest. I never worked for anybody else after that… I was always creating new things to keep the association sustainable. What a perfect background for your move to Byron. When one moves here one has to be pretty creative with how they’re going to generate an income and you were already doing that. So when did you first come up here? We came here for our honeymoon back in ’71, then the next time was ’82, and from there we use to come up here twice a year for about 15 years. But we actually relocated here in ’97. And were you still working for the Surfing Association? Yeah. I was working 2 days for the Victorian office and 3 days for the national office which was still based in Torquay at that stage. Later the national office was moved out of Victoria to Burleigh Heads, so I moved to Byron and drove each day up to Burleigh. We eventually secured a national office and established a high performance centre in the Casuarina development. We had about 15 staff working with us then, all trained for the various programs. We would design the programs, get the sponsorship and set them up, then hand them to the States to run. So we had quite a big operation there for awhile. The high performance centre has just recently received a 2 million dollar grant to build a state of the art facility dedicated to scientific research of surfing. Looking at your bio we see you have done everything in surfing administration from carrying the drinks bottles to Secretary General of the International Surfing Association. It’s a formidable list compiled over 48 years: Administrator of the Year (it seems like every year), Surfing Halls of Fame, Life Membership awards, and the list goes on and on and on… to your recent retirement as Vice President of the International Surfing Association and current consultancy role as technical director at various international events. I’m exhausted… aren’t you? Laughing he says… yes, well Glenice and I have retired. I’m nearly 60 and haven’t retired before so we’ve got to work out how we’re going to do it. Bringing it back to Byron… after all that’s what the blog is meant to be about…what was it like back in ’97? Well there were fewer traffic jams! We bought a unit off the plan in Sunrise, and when it was completed we moved up here into that. We kept the house in Anglesea while we decided if we were gong to stay or not… but once we were here we never looked back. In ’97 we paid $95k for a block up the hill in Byron Hills and built on that. It’s a great area to live and now with the skate park and oval down near the lake there are lots of people using the facilities and a real sense of community. And now with Shaz and Baz on Beech Drive there is an even greater sense of community. Aren’t they amazing…those two? We found Byron a really welcoming community. Like the kids were really welcomed at the school (Byron High)… one was in year 10 and the other year 11 when we moved and the kids at the school totally took them in. 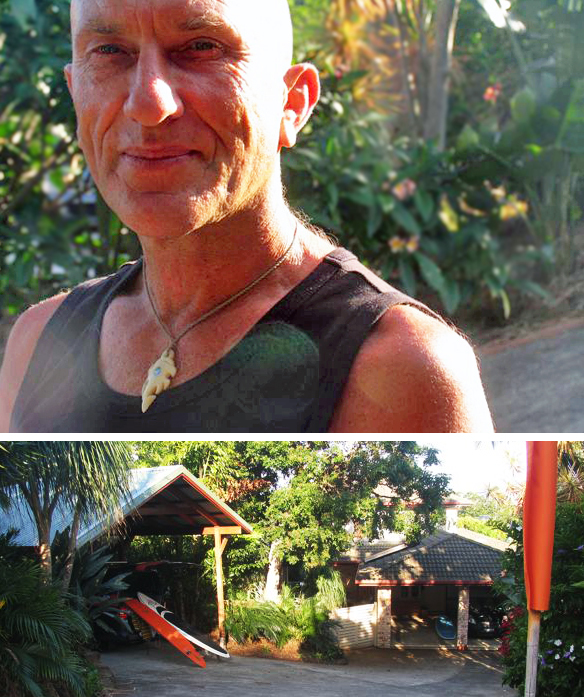 What about the surfing community… what’s special about surfing in Byron? Sitting on your board in the water around the Cape in the early hours is pretty serene… and when the dolphins swim by, you do get a really good sense of wellbeing… the surrounding hills in the distance… the colours of the environment are beautiful… especially at sunset… the purples and blues… the colours of the setting are really rich. Glenys adds… my first experience at The Pass was pretty special. There is something really different about that break… it is so serene. There is something about it that keeps drawing you back. I felt like I was meant to be here. I haven’t experienced anything like it, in any other place, ever before. It would be outright wrong to omit the mandatory surfing shots! Pics courtesy of Alan. You have clearly answered our next question… what are the joys of living here? But is there anything else you would like to add? The moderate climate here. After living in Victoria the climate here is definitely a joy. Like when it rains, it’s not cold and when you get out of the surf, you can still feel your toes! Glenys adds… Even when we first moved here you could always get what you wanted in town. For a small town it had great restaurants and a great range of shops. The thing that’s a small problem now is no Retravision. Now we have to go to Ballina for anything electrical. I really liked the diversity of what you could get here. I also love the Arts and Industrial Estate. You get great stuff there and the markets… particularly the Bangalow market. We love going up there. It’s got that village atmosphere the Byron market lacks… and great Turkish coffee. What are the challenges of living here? (Long pause) I’m trying to think what they are! Clearly work hasn’t been an issue for you guys. No. I think Tourism is one of the biggest challenges…like the resultant traffic problems. Its’ a real problem for communities like this. The town gets forgotten. The State Government and the powers that be seem to overlook the town’s infrastructure. And it really eats at me that the cost of infrastructure falls onto the ratepayers. But it’s probably the same in many towns that attract tourists. The effect of tourism on the people who live here. I’ve got no problem with tourism because that’s what supports the town, but the ratepayers need to be looked after as well. A few of Alan’s other favourite things! Ed’s note: It’s taken a couple of months to get this interview posted due to Christmas, New Year and life in general, but I would like to add… during our interview with Alan way back in November, I commented that he was inspiring me to get back in the water. It has been a couple of decades since I have been out in the surf on my body board and I am pleased to report, I have done it! But there are no prizes for guessing who I saw out there! Thanks Alan… for the inspiration and it was a hoot bumping into you in your environment. The Beach Hotel. We used to have breakfast there but now we have a coffee machine we don’t go to cafes anymore. What’s your favourite thing to do in Byron? To go surfing around the Cape. Is there any one person in the area that has inspired or influenced you? That’s a hard one. I use to see old Ron Ware when we first came up here and he was out surfing amongst the crew. There was a really nice atmosphere right up until he died. I had a lot of time for Ron. What would we find you doing on a typical Saturday morning? Coffee, then surf and step class at the Byron Gym, followed by yoga. Whats your fave blog or website? Coastal Watch. We don’t really use the internet for entertainment. It’s a tool for us. What’s your fave shop in Byron? Mitre 10 for Alan and for Glenys…Garden of Eden Nursery. What’s your local’s tip to a visitor? Pack a lunch for the trip in! (much laughter). But seriously…enjoy the place…cos there’s not many like it left in the world. Alan sold me a pair of ugg boots. Within a few days my toes had poked through the end as the boots had a flaw there. I never did receive a new pair or a refund.